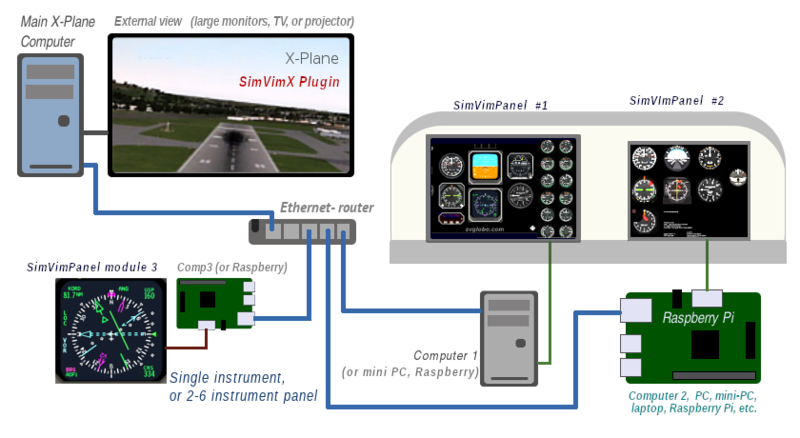 SimVimPanel is a standalone program providing a set of realistic, fully-functional aircraft instruments to be displayed on a computer that is connected by network to the main computer with X-Plane. The system is built in such a way that any number of computers with different instrument panels can be connected to the main computer running X-Plane. The program doesn't require any configuration on the user's part. Once you download our SimVim plugin for X-Plane and run the program on another computer in the local network, they will connect automatically. The instrument panels themselves are designed to accurately represent the functionality and positions of the actual instruments of specific aircraft. Every instrument is made as close to original as possible and has real sizes on the chosen LCD screens. SimVimPanel is not a constructor, it's a set of a ready-to-use panels for specific aircrafts. The project is ongoing, and in time we will be making panels for more types of aircraft. The program doesn't require a powerful system - any old PC with processor frequency of about 1000 Mhz can be used. For our Baron-58 one very old PC is used for full panel, a Celeron 1000 with an old Nvidia 5500 card. A convenient way is to use an old laptop with additional LCD monitor connected to it. Here is an example of the "basic six" running very smoothly on Asus EEE PC 900 netbook (see the video below, it's taken from laptop screen with camera). Almost every old laptop has a VGA output, allowing the connection of a larger display, making for a rather cheap (and quiet) system. You can even connect it with wi-fi instead of a cable. This is the core program required to launch SimVim Panels. Download the core program, and then download a data pack for the panel you want. at least equivalent of Ubuntu 12 or newer, Linux Mint 13, etc. Will be available if requested. Compiled and tested on Raspbian Jessie. For the older version of the core program and modules compatible with ArdSimX, see this page. These packs contain all the data for panels to be used with the core program. Download the panel file you want to use and place it in SimVim core program's directory. Note: some of panels in the list above are in the development state or planned to be added. The program needs to be run on a separate computer connected by LAN to the computer running X-Plane with SimVimCockpit plugin. When the plugin is searching for connections, it will find SimVim Panel automatically. A panel module must be loaded into SimVim core program for the connection to be established. Though we have a set of several panels only, we can make any specific panel, especially if you can provide all information (docs, good quality photos, graphics). The only factor is the time available to do this, since we spend much of it on SimVimCockpit Interface development and improvements.